ST. PAUL, Minnesota (CNN) -- John McCain accepted the Republican nomination for president Thursday night "with gratitude, humility and confidence" as thousands of delegates chanted his name. Sen. John McCain says the "do nothing" Washington crowd is in for a change. "Let there be no doubt, my friends, we're going to win this election," he said. In a speech before a giant screen showing an American flag waving against a blue background, McCain promised to put the people first. "I understand who I work for. I don't work for a party. I don't work for a special interest. I don't work for myself. I work for you," he said, to cheers from the crowd. McCain portrayed himself as a fighter, saying he had fought corruption and big spenders, regardless of which party they came from. "I've fought to get million dollar checks out of our elections. I've fought lobbyists who stole from Indian tribes. I fought crooked deals in the Pentagon. I fought tobacco companies and trial lawyers, drug companies and union bosses." But, he said, he had learned through a lifetime of fighting "it matters less that you can fight. What you fight for is the real test." "I fight for Americans. I fight for you," he said. In a speech that used the word "fight" or "fought" 34 times, McCain vowed he would "fight to make sure every American has every reason to thank God, as I thank Him: that I'm an American, a proud citizen of the greatest country on Earth, and with hard work, strong faith and a little courage, great things are always within our reach." McCain rattled through a number of talking points designed to appeal to his Republican base. iReport.com: Did McCain seal the deal? "We believe in a strong defense, work, faith, service, a culture of life, personal responsibility, the rule of law, and judges who dispense justice impartially and don't legislate from the bench," the Arizona senator said. He contrasted his aims with those of his "opponent," who, he said, would raise taxes and institute a health care system that would force "small businesses to cut jobs, reduce wages, and force families into a government-run health care system where a bureaucrat stands between you and your doctor." 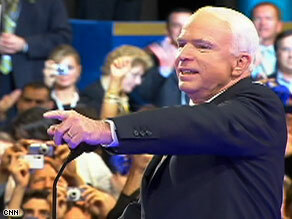 Obama's campaign issued a barrage of statements rebutting McCain's attacks, some as the speech was still going on. The campaign cited experts who said the Obama tax plan offered bigger cuts than McCain's for the bottom 80 percent of earners, and asserted that McCain's health care plan would "erode the employer-based health system" without reducing the ranks of the uninsured. Much of the loudest applause during McCain's speech came when he spoke about his running mate, Alaska Gov. Sarah Palin, who received a rapturous reception when she gave her national debut speech Wednesday night. But he also drew cheers for a promise to seek energy independence through more oil drilling, nuclear power, clean coal, renewables, and flex fuel and hybrid cars. "We are going to stop sending $700 billion a year to countries that don't like us very much," he said in reference to American oil imports. A respectful hush fell over the audience when McCain spoke of his time as a prisoner of war in Vietnam, a captivity that lasted 5½ years after he was shot down over Hanoi as a Navy flier. That was when he "fell in love" with his country, he said: "when I was a prisoner in someone else's." He closed his speech with an exhortation to service. "Our country will be the better, and you will be the happier," he said. "Because nothing brings greater happiness in life than to serve a cause greater than yourself." "I thought it was a great speech," Illinois state Rep. Dan Brady said. "I thought that it showed Sen. McCain in one of his finest moments. He articulated his message -- change." Will Barfoot, a delegate from Montgomery, Alabama, said the speech was "wonderful." "He is the only man that can lead this country in the time that we're in now. Thank God he's the man we are going to elect," Barfoot said. Obama campaign spokesman Bill Burton disagreed. "John McCain said that his party was elected to change Washington, but that they let Washington change them," Burton said. "He's right. He admonished the 'old, do-nothing crowd' in Washington, but ignored the fact that he's been part of that crowd for 26 years, opposing solutions on health care, energy, and education," Burton continued. "He talked about bipartisanship, but didn't mention that he's been a Bush partisan 90 percent of the time, that he's run a Karl Rove campaign, and that he wants to continue this president's disastrous economic and foreign policies for another four years." McCain was interrupted at least once by protesters from the anti-war group Code Pink, who were shouted down by delegates shouting "USA," as they had been instructed to do. Protesters were physically removed from the hall. McCain was formally nominated the night before. If he defeats Obama in November, he will become the oldest person to be elected to a first term in the White House.